On the 25th of January I presented a first version of a paper on short URLs during our Digital Methods Winterschool 2012. It contains a case study that aims to map and analyze how devices treat a hyperlink by looking into what happens when a link is shared on a platform and therewith adopted by the platform. The purpose is to illustrate the social life of a link shared on Twitter by investigating the actors that are involved in the sharing and proliferation of links. Check resonance of the link on Twitter using Topsy. All links are t.co links because Twitter wraps all links using its t.co Link Wrapper. Follow all these t.co links to see where they resolve to. My colleague Bernhard Rieder kindly wrote a cURL script that resolves short URLs. The server’s HTTP header was requested and outputted with cURL. The output of the header shows the path of redirection until the final destination, the Huffington Post URL, is reached. Put all redirections in a spreadsheet. 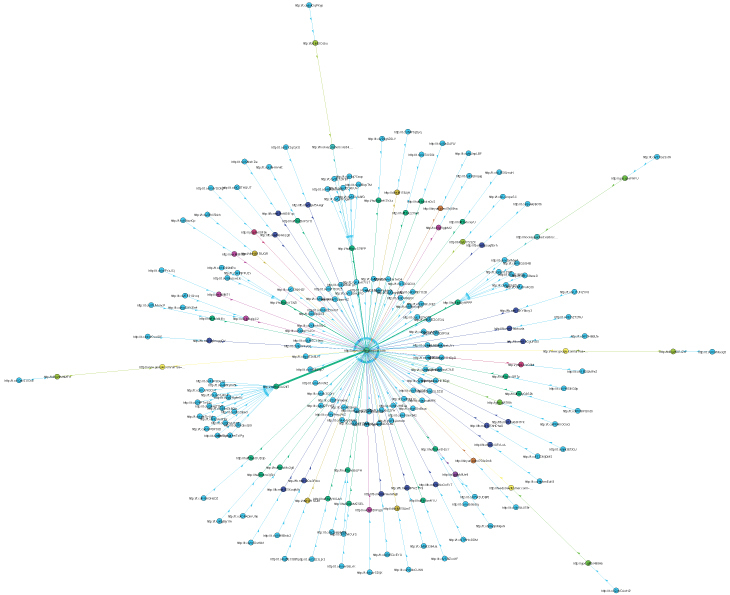 Export spreadsheet as a .csv file and then transformed into a Gephi file using the a custom DMI CSV to GDF tool. Code all redirections with the name of their URL shortener. The connections between the links, the path of redirects, were then visualized using Gephi. The following image shows the t.co network of one single Huffington Post article URL. The visualization is a different type of visualization than normally produced as the output of hyperlink network visualizations because it does not show the links between different sites but rather the network of links of one single hyperlink, a canonical URL. The image shows how one single hyperlink can be made available under numerous unique URLs that all redirect to the same link. The figure also illustrates where a link was shared from and its travels after sharing. Some links are taken up by several actors before being posted to Twitter. In this small sample of 150 links about two-thirds was routed through another url shortener before t.co. It shows the actors involved in the politics of dataflows where each actor wants to track how many times a link has been clicked or shared and where. Full size image on the DMI wiki (PDF). Postscript: Axels Bruns is currently exploring a similar approach as outlined in his blogpost Resolving Short URLs: A New Approach. Next Next post: David Gelernter on the lifestream, time, pace and space.